RESERVE ONLINE AND 1 CHILD FREE FOR EACH PAID ADULT. This promotion is only valid when booking one paying adult. Once your purchase is complete please contact us to register the child, This promotion is valid until further notice Don't miss out! Have an enchanting encounter with bottlenose dolphins when you sign up for the Dolphin Swim Experience Vallarta Adventure Tour. This hour long activity adds a fun and informative touch to your Puerto Vallarta vacation. Once you arrive at the Dolphin Adventure Center you’ll receive a half hour interactive presentation that demonstrates how to best communicate with the dolphins. 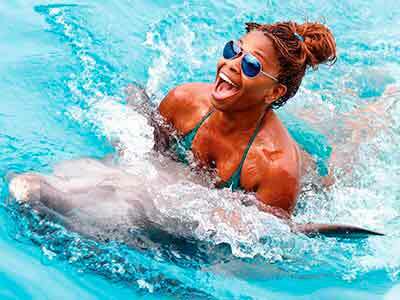 Following that, groups of up to eight visitors will travel to the Dolphin’s Lagoon, where these delightful creatures are waiting to swim, play and enjoy your company.